When I was young I had a microscope. I didn’t use it very much. Just enough to see some little creatures swimming around in pond water, look at some insect parts, and things like that. 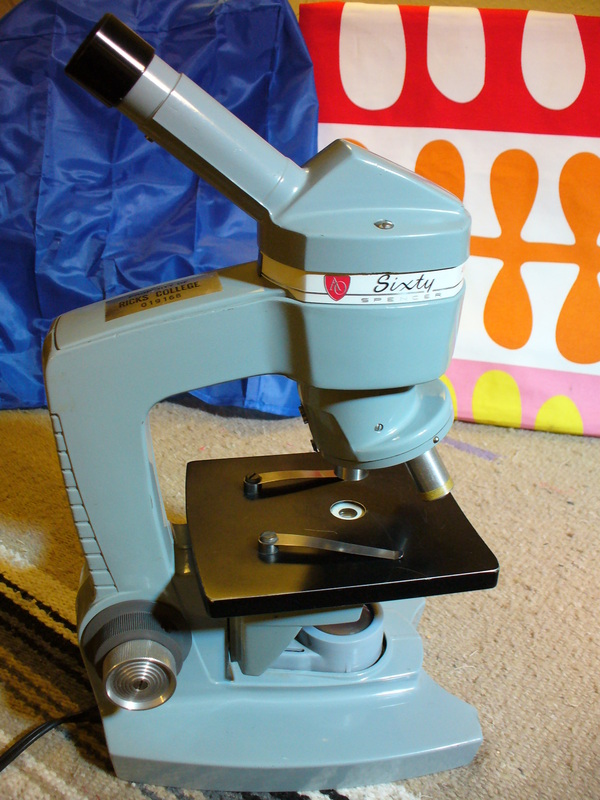 But when I saw a lab microscope last year at Palouse Treasures, being sold for a tenth of what it was worth, I had to get it. Now someone who really has a use for one has expressed an interest in it. So I thought I better take some photos of it and put up an article. According to the historians, Dutch lens makers (for eyeglasses) were the first ones on earth to put together microscopes, back in the late 1500s. This may be true. Antonie van Leeuwenhoek (1632–1723) is a famous name in microscopy, pioneering the use of this instrument as a research tool in biology. As a Scientologist I am aware that all earth technologies had earlier versions elsewhere. The process here on earth has been one of re-familiarization, not “first art,” for the most part. Optical microscopes served us well until the 1930s, when some electronics guys were able to throw together some instruments that magnified things much better than optical microscopes could. Meanwhile, optical lenses continue to be used for so many different purposes it would be difficult to list them all. Parts of an optical microscope. I don’t particularly want to get into a whole thing on optics here. The point was to just get some photos of a microscope up on my blog, with a few of the basic technical terms. Perhaps one of the more fascinating things about this instrument, and many others like it, is the solidity of its design and the obviously precision machining that went into many of its parts. In many modern machines, the technique that goes into their construction is mostly hidden under a cute or simply practical cover. Unless you open things up, you won’t notice all the precision parts that go into the things we use (I am thinking of computer disk drives). But with this microscope, the machined surfaces are right out there to look at. 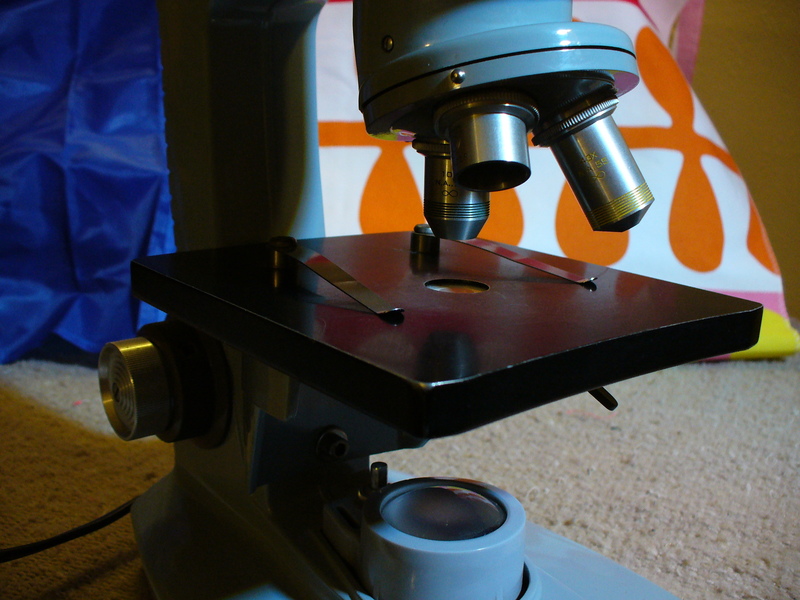 The microscope is an example of a long list of tools designed to extend human perception. The fact that we find ourselves in a situation where we must construct sophisticated machines to extend the abilities of our bodies (which are rather sophisticated biological machines in themselves) is quite ironic. We had – in theory at least – the full range of perceptions to start with. We ended up “inside” a very limiting body for reasons best left for researchers such as LRH to explain. Only a very few people on earth are beginning to experience the range of perceptions that are available to a being when it operates exterior to a body. There have even been techniques developed to rehabilitate lost perceptual abilities, including the ability to sense things like magnetism and radio waves. I am very interested to see where this process of rehabilitation will take us!